Bass Reeves (July 1838 – January 12, 1910) was the first black deputy U.S. marshal west of the Mississippi River. He worked mostly in Arkansas and the Oklahoma Territory. [a] During his long career, he was credited with arresting more than 3,000 felons. He shot and killed 14 outlaws in self-defense. Robert, Lula, Sally, Benjamin, Newland, Harriet, Homer, Edgar, George, Alice, Bass Jr.
Reeves and his family farmed until 1875, when Isaac Parker was appointed federal judge for the Indian Territory. Parker appointed James F. Fagan as U.S. marshal, directing him to hire 200 deputy U.S. marshals. Fagan had heard about Reeves, who knew the Indian Territory and could speak several Indian languages. He recruited him as a deputy; Reeves was the first black deputy to serve west of the Mississippi River. Reeves was assigned as a deputy U.S. marshal for the Western District of Arkansas, which had responsibility also for the Indian Territory. He served there until 1893. That year he transferred to the Eastern District of Texas in Paris, Texas, for a short while. In 1897, he was transferred again, serving at the Muskogee Federal Court in the Indian Territory. Reeves worked for 32 years as a federal peace officer in the Indian Territory, and became one of Judge Parker's most valued deputies. Reeves brought in some of the most dangerous criminals of the time, but was never wounded, despite having his hat and belt shot off on separate occasions. In addition to being a marksman with a rifle and pistol, Reeves developed superior detective skills during his long career. When he retired in 1907, Reeves claimed to have arrested over 3,000 felons. He is said to have shot and killed 14 outlaws to defend his life. Once, he had to arrest his own son for murder. One of his sons, Bennie Reeves, was charged with the murder of his wife. Deputy Marshal Reeves was disturbed and shaken by the incident, but allegedly demanded the responsibility of bringing Bennie to justice. Bennie was eventually tracked and captured, tried, and convicted. He served his time in Fort Leavenworth in Kansas before being released, and reportedly lived the rest of his life as a responsible and model citizen. When Oklahoma became a state in 1907, Bass Reeves, then 68, became an officer of the Muskogee Police Department. He served for two years before he became ill and retired. Reeves' health began to fail further after retiring. He died of Bright's disease (nephritis) in 1910. He was a great-uncle of Paul L. Brady, who became the first black man appointed as a federal administrative law judge in 1972. In 2011, the US-62 Bridge, which spans the Arkansas River between Muskogee and Fort Gibson, Oklahoma, was renamed the Bass Reeves Memorial Bridge. In May 2012, a bronze statue of Reeves by Oklahoma sculptor Harold Holden was erected in Pendergraft Park in Fort Smith, Arkansas. In 2013, he was inducted into the Texas Trail of Fame. The Black Badge: Deputy United States Marshal Bass Reeves from Slave to Heroic Lawman by Bass Reeves great-nephew, retired federal Judge Paul L. Brady. Black Gun, Silver Star: The Life and Legend of Frontier Marshal Bass Reeves by historian Art T. Burton, published in 2006, is the only scholarly account of Reeves' life to date. A children's biography by Vaunda Micheaux Nelson, Bad News for Outlaws: The Remarkable Life of Bass Reeves, Deputy U.S. Marshal, won the 2010 Coretta Scott King Award. Illustrator and historian Joel Christian Gill published a graphic novel in 2014 called Tales of the Talented Tenth, Volume 1, which featured Reeves' life. Authors Ken Farmer and Buck Stienke have written five novels inspired by the exploits of Reeves: The Nations, Haunted Falls (winner of the Laramie Award for best action Western, 2013), Hell Hole, Across the Red, and Bass and the Lady. Author Elizabeth Bear depicted Reeves in her 2015 Wild West/steampunk novel Karen Memory. Reeves "guest-stars" in the ninth volume of the Atomic Robo comic book series, "Atomic Robo and the Knights of the Golden Circle". Set in 1884, it features Robo, Reeves, and Doc Holliday fighting as a team against a mad scientist. "Bass Reeves: The Real Lone Ranger" is the title and subject of an episode of Legends and Lies: The Real West. "Bass Reeves - The Real Lone Ranger" is also the title and subject of a season two episode of Gunslingers. Reeves is portrayed by Joseph Callender. Reeves figures prominently in an episode of How It's Made, in which a Bass Reeves limited-edition collectors' figurine is shown in various stages of the production process. In "The Murder of Jesse James", an episode of the television series Timeless (season one, episode 12), Bass Reeves is portrayed by Colman Domingo. Reeves was a featured subject of the Drunk History episode "Oklahoma" in which he was portrayed by Jaleel White. In "Everybody Knows", a season two episode of the television series Wynonna Earp, Reeves is portrayed by Adrian Holmes. Bass Reeves figures into the plot of The Royal Family 2nd season episode "Greenleaf". Bass Reeves, a 2010 fictionalized account of Reeves' life and career, stars James A. House in the titular role. A miniseries based on Burton's 2006 biography (and co-produced by Morgan Freeman) is reportedly under development by HBO. As of April 2018, Amazon Studios is developing a biopic of Reeves with the script and direction helmed by Chloé Zhao. Bass Reeves is a character in the miniature wargame Wild West Exodus. Bass Reeves is a playable character in the board game Western Legends. Bass Reeves served as the inspiration for Sheriff Freeman in Red Dead Redemption 2. ^ Indian Territory comprised most of what became Eastern Oklahoma on November 16, 1907, when Oklahoma became a state. Reeves' former position as a U.S. Marshall was abolished at that time, so he became an officer with the Muskogee Police Department, where he served for two years until he was forced to resign because of his declining health. ^ a b c Burton, Art T. (2008). Black Gun, Silver Star: The Life and Legend of Frontier Marshal Bass Reeves. Lincoln, Nebraska: U of Nebraska Press. pp. 19–20. ISBN 9780803205413. ^ a b c d e f g h Burton, Art T. (May – June 1999). "The Legacy of Bass Reeves: Deputy United States Marshal". The Crisis. 106 (3): 38–42. ISSN 0011-1422. ^ a b c Burton, Art T. (2008). Black Gun, Silver Star: The Life and Legend of Frontier Marshal Bass Reeves. Lincoln, Nebraska: U of Nebraska Press. pp. 21–23. ISBN 9780803205413. ^ "Bass Reeves - Black Hero Marshal". Legendsofamerica.com. Retrieved 9 June 2016. ^ a b c d e f g "Bass Reeves, the Most Feared U.S. Deputy Marshal". The Norman Transcript. 3 May 2007. Archived from the original on 7 September 2012. Retrieved 31 August 2016. ^ a b "Deputy U.S. 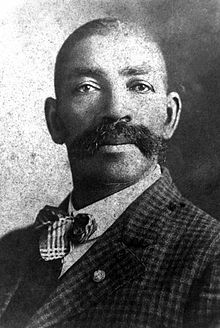 Marshal Bass Reeves". U.S. Marshals Museum. U.S. Marshals Museum, Inc. Archived from the original on 2 March 2014. Retrieved 27 August 2013. ^ Burton, Arthur; Art T. Burton (2006). Black Gun, Silver Star: The Life and Legend of Frontier Marshal Bass Reeves. Lincoln: University of Nebraska Press. pp. 139–148. ISBN 978-0-8032-1338-8. ^ "Judge Paul L. Brady Retires from Job Safety Commission" Archived 15 February 2013 at the Wayback Machine. press release: United States Occupational Safety and Health Review Committee. 15 April 1997. Retrieved 13 August 2007. ^ Goforth, Dylan (11 November 1977). "Bridge to be renamed in tribute to famed lawman". Muskogee Phoenix. Retrieved 6 August 2013. ^ "Statue of U.S. marshal to travel from Oklahoma to Arkansas Wednesday", Associated Press in The Oklahoman, 16 May 2012 (pay site). ^ "Bass Reeves". Western Heritage from the Texas Trail of Fame. www.texastrailoffame.org. 26 December 2013. Retrieved 14 April 2018. ^ Manzoor, Sarfraz (22 March 2013). "America's forgotten black cowboys". bbc.co.uk. BBC. Retrieved 22 March 2013. ^ "Was an African American Cop the Real Lone Ranger?". cnn.com. CNN. 6 August 2013. Retrieved 13 October 2018. ^ NPR Staff (14 February 2015). "'Strange Fruit' Shares Uncelebrated, Quintessentially American Stories". Code Switch. National Public Radio. Retrieved 15 February 2015. ^ Legends and Lies, Season 1, Episode 9: "Bass Reeves: The Real Lone Ranger". Internet Movie Database. Retrieved 18 October 2015. ^ Gunslingers, Season 2, Episode 4: "Bass Reeves - The Real Lone Ranger". Internet Movie Database. Retrieved 18 October 2015. ^ "How It's Made: Resin Figurines". science.discovery.com. Science Channel. Archived from the original on 22 September 2013. Retrieved 19 June 2014. ^ "Mini About Hero Lawman Bass Reeves In Works At HBO With Morgan Freeman, Lori McCreary & James Pickens Producing". Deadline.com. 18 May 2015. Retrieved 25 January 2017. ^ N'Duka, Amanda (20 April 2018). "Amazon Studios Lands Biopic on Bass Reeves, First Black U.S. Deputy Marshal, From 'The Rider' Helmer Chloé Zhao". Deadline.com. Retrieved 12 May 2018. Paulsen, Gary (2006). The legend of Bass Reeves: being the true and fictional account of the most valiant marshal in the West. New York: Wendy Lamb Books. ISBN 978-0-385-74661-8. Wikimedia Commons has media related to Bass Reeves.